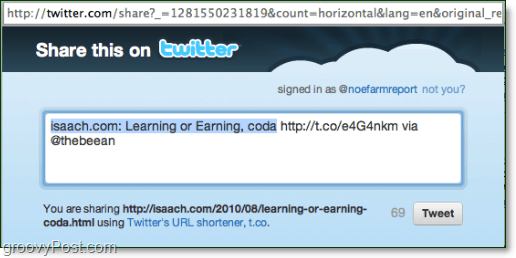 When browsing our site and many others, you’ve likely noticed the “retweet” and other Twitter related sharing badges. Up until now, if you wanted to quickly share a link on twitter you were required to use a 3rd party service who normally provided those share buttons/options to blogs. Well yesterday this all changed when Twitter announced the release of their own native Tweet button which Blogs and Websites can implement immediately. Honestly, I’m not sure why they didn’t do this earlier! The new Twitter “tweet” button comes from direct collaboration and partnership with the small company that brought us the first “retweet” button, Tweetmeme. So don’t worry, Tweetmeme isn’t going anywhere, they are onboard with Twitter for this one! 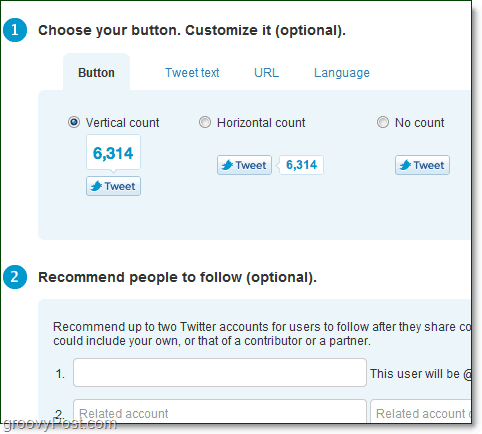 At https://twitter.com/goodies/tweetbutton you can set up a customized Tweet button for your site. What is really noteworthy however is the recommended people to follow. If you fill in the recommendations, then people will be prompted to follow them whenever they Click one of the tweet badges that you’ve posted. The process is so easy, I’ve already updated our blog here at groovyPost.com to include the new button so be sure to use the new button anytime you enjoy one of our articles!